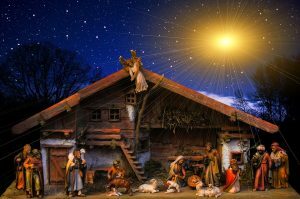 Have you ever wondered how it came to be that we celebrate Jesus’s birthday? From the earliest days, Christians have celebrated his resurrection, but when did we start to celebrate his birth? It was enlightening to learn that there has always been tension between the religious celebration of the holiday and the secularization of it. It is not just our generation that has had to struggle with this. Below is a short summary of this research and a list of books if you, too, want to dig deeper. You can also snag a FREE copy of my History of Celebrating Christmas Unit Study to include in your homeschooling through the holidays lesson plans! To get your free copy of the History of Celebrating Christmas Unit Study, simply enter your name and email address into the form below! 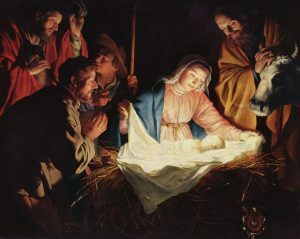 What Does the Bible Tell Us About Jesus’s Birth? The story of Jesus’s birth in the bible is relatively short. Luke and Matthew tell us that Jesus was born in Bethlehem to the Virgin Mary. According to Luke, Joseph and Mary travel from Nazareth to Bethlehem for the census where Jesus is born and laid in a manger. It says angels visited shepherds in their fields and told them that a Savior had been born. The shepherds then go to visit Jesus to see if it is true. They spread the word that Jesus was born. Matthew tells us that wise men follow a star to Bethlehem to bring gifts to Jesus, born the king of the Jews. King Herod is concerned by this and orders all the boys less than two years old in Bethlehem to be killed. However, Jesus’s family flees to Egypt and later settles in Nazareth. Birthdays were not important during Jesus’s time. It is likely that his disciples did not know when his birthday was nor did they celebrate it. The bible does not give us a date for his birth. The important day during Jesus’s time was the day of baptism. Many Christians around the world celebrate Epiphany on Jan. 6th marking both the day the wise men visited the baby Jesus and the day he was baptized by John the Baptist. This celebration started at the end of the 2nd century. It wasn’t until the middle of the 4th century that Julius I, Bishop of Rome (337-352) decreed that Jesus’s birth would be observed as a holy day on Dec. 25th. Constantine the Great, the Roman Emperor, had recently ended persecution of Christians and joined the Christian church (313 AD). The day was called the Feast of the Nativity. Since the bible has limited information about the time of year Jesus was born, there is great debate on this topic. May 20, April 18 or 19, March 25, January 2, November 17, and November 20 have all been suggested as possible dates. Many factors contributed to selecting December 25 as a date of celebration. It was the date of the winter solstice on the Roman calendar. It was also about nine months after March 25, the date of the vernal equinox and a date linked to Jesus’s conception. There were already festivals during the winter solstice and it is thought the church chose this date so that it would be easy for people to celebrate Jesus’s birth. It was also a time when people had plenty of food to celebrate with since they just finished the fall harvest and slaughtered many of their animals. Unfortunately, linking the celebration of Jesus’s birth with other celebrations meant that the church had little control over HOW people would celebrate. Many people continued to celebrate in the same way they had celebrated the winter solstice. In fact, sometime before George of Nazianzus died in 389, he found it necessary to warn against the dancing and excessive feasting on the holy day. This tension of how to celebrate Christmas would continue for hundreds of years. 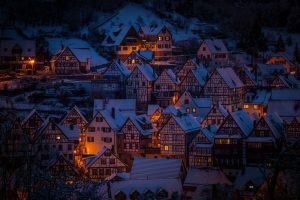 People celebrated Christmas in a variety of ways depending on where they lived and their place in the social structure. It took a few hundred years for the day to spread across Europe. Some Christians continued to celebrate Epiphany and some moved to celebrating Christmas Day. In France, it was decided in the 500s to celebrate 12 days of Christmas starting on Christmas and continuing until Epiphany. By the Middle Ages, many celebrated with food and drink and a night or more of ‘misrule’. This was similar to trick or treating on Halloween. People would visit houses of the rich and demand food and drink or they would make mischief. A more religious way to celebrate was to put on Christmas plays about Jesus’s birth. These were held in churches and by civic guilds. In 1223, Francis of Assisi first produced a live nativity scene with a manger, an ox and a donkey. This became popular across Europe, although most people used models rather than live scenes. Christmas carols began in the 12th century and became even more popular in the 16th century. By the 1600s, gift giving was popular. In Germany, in the mid-1600s, burning of the Yule log became popular and Christmas trees became widespread in the 1700s. 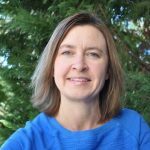 The tension that existed throughout the Middle Ages between religious and secular celebrations of Christmas continued into the settling of America. Some states celebrated Christmas in some manner, but some groups such as the Puritans, outlawed the celebration of Christmas because it was filled with so much rowdiness and mischief making. In the 1800s, Christmas traditions changed once again to focus more on family celebrations. 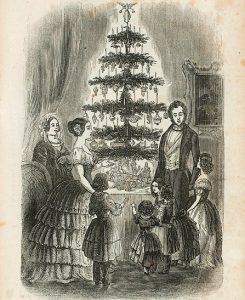 Dickens gives us a view of these family-centered celebrations in the Pickwick Papers and A Christmas Carol. Paintings in the mid-1800s also depict these family celebrations in homes with children around a Christmas tree. Giving books as gifts became popular at this time. Over the last 150 years, many of these traditions have persisted, although it seems that Christmas day traditions continue to evolve over time. We all play an active role in the creation of history! How does your Christmas compare to these traditions from the past? What new traditions might you add? How will you navigate the religious and secular aspects of the day? PrevPrevious PostShould You Take a Homeschool Break the Entire December? Hi This looks brilliant, but i can’t find a link to download? My error! It’s there now!